Our second book is now available on nostarch.com, on Amazon.com, and on Barnes & Noble. Enter the fantastical world of model building. The LEGO Neighborhood Book 2 is a full-color guide to creating intricate, bustling LEGO neighborhoods, and cities. In this second volume, a follow up to the runaway best-selling first volume, readers learn even more ways to create classic architectural styles using only LEGO bricks. In addition to creating entire buildings, LEGO model-building experts Brian and Jason Lyles also show readers how to create interesting architectural features like cornices, false fronts, porches, and detailed interiors and furniture. 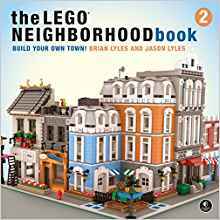 With instructions for three buildings and many smaller builds, The LEGO Neighborhood Book 2 is sure to provide hours of building fun and inspiration for readers of all ages. We've included some companion files on this page to assist you in building the main model in the book. There are 2 parts lists available to you; a checklist style list that opens up in your browser and a XML file that you can use to upload the complete parts list to Bricklink's wanted list feature. If you're not familiar with how that works, or Bricklink, check out the BCD Tutorial and the BrickLink Tutorial Enjoy! Our first book is available on nostarch.com, on Amazon.com, and on Barnes & Noble. The LEGO Neighborhood Book is your guide to creating incredible LEGO buildings. Snap together a few apartments, shops, houses, and soon you'll have a whole neighborhood! Inside these pages, you'll learn techniques for recreating classic architectural styles in LEGO bricks, like San Francisco's famous Victorians and New York City's brownstones. LEGO model-building experts Brian and Jason Lyles will teach you how to create interesting architectural features like cornices and false fronts, and how to construct porches and detailed interiors. 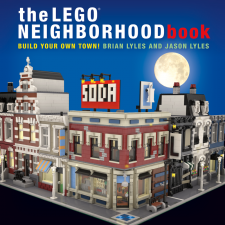 With full color instructions for three multistory houses and many smaller builds (like a reclining armchair and an old-timey lamppost), The LEGO Neighborhood Book will give you hours of building fun. What will your neighborhood look like? We've included some companion files on this page to assist you in building the models in the book. Each of the larger models has 2 parts lists available to you, a checklist style list that opens up in your browser and a XML file that you can use to upload the complete parts list to Bricklink's wanted list feature. If you're not familiar with how that works, or Bricklink, check out the BCD Tutorial and the BrickLink Tutorial We've also included a PDF with instructions on how to build a delivery truck that fits into the Corner Drug Stores delivery bay. Parts lists for the truck are also included. Enjoy! Check out some of these reviews the book has been getting!